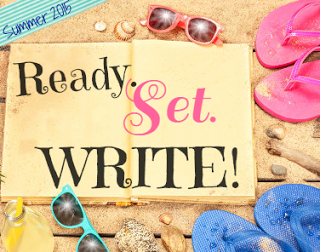 Ready.Set.Write! is a summer writing intensive hosted by Jaime Morrow, Alison Miller, Katy Upperman, Erin Funk, and Elodie Nowodazkij. Every Monday participants share how they're doing in reaching their goals for the summer. To see a full list of participants, go here. 1. How I did on last week's goals: I forgot to set goals last week to report on for this week, but I got in 3,690 words on my YA paranormal, and I got 20 pages of my hard copy edits into the computer. I got a bit derailed by writing an adult short story that has a bit of a literary twist (at least for me) and then also writing a picture book. With art notes and everything! It's not very good, but it's something I've wanted to do for awhile, so I did it. 2. My goal(s) for this week: Write 8,000 words on the paranormal. Get in 60 pages of hard copy edits. Just a ghost dog and a ghost horse, keeping watch on a French Quarter street corner. 5. Something I love about my WiP: That the main character, Flannery Hale, has a limp. I've wanted to write a character with a limp for forever! As a kid I was fascinated by limps, and used to practice walking with one. Which I know is terrible. Now, all grown up, I am very grateful I do not have a limp. I just impose them on fictional people. Wow. You've done a lot. A character with a limp is pretty cool. Someone else who takes advantage of work time! (I blog instead of write though.) Eight thousand words - you can do it. Oh, I wish I could blog! Work blocks anything that even remotely looks like a good time though. Boo. Holy moly you've accomplished a ton! And wahoo and congratulations on your story being published! That's so awesome! I need a job like that. hee hee. Love the line you shared, Leandra! It's all sorts of intriguing! Congrats on your publication and all the words you achieved this week! And so sorry about your computer. I hope it's all better now. :) Good luck this week! I'm cheering you on! I hope it's all better too! So far, so good. And thanks! Damn, girl! You did awesome this week! Bravo! Congrats! That is awesome! Also having a character with a limp is really interesting. I have a limp myself, and love creating characters with limps or leg injuries. That gave me all the firsthand research I ever could've asked for regarding knowing how to accurately write the pain of a leg injury and the terror and nervousness of starting to walk again. Eerily enough, two of my characters had limps written into their stories long before I got my own limp. It were almost as if I knew, even before I knew. The protagonist of my current WIP has more than just a limp, given his health condition, and needs to limit his mobility and stay in bed or a chair for much of the time while recovering from an injury. Thank God I don't have hemophilia, but I can relate a lot better to his frustrations now than when I was originally writing this story 19 years ago. Sorry for your troubles, Carrie-Ann. That would be super hard! And that is eerie! Boo to broken computers, but yay to being able to write at work. I have to admit to having snuck in a little writing from time to time. I can't have a single moment in the day when I'm not doing something, though. Having a limp... wel, I pity your characters. I don't like mine at all. That said, I love your sample line. And yes... I really love that you just went and wrote that story you'd been wanting to write. Good for you! But you also have all kinds of energy going into taking care of a newborn. So hats off to you, ma'am! That's a great line! And the limp is intriguing. Best of luck tackling your 8K! Thanks, I need that luck! Great, you're on a roll! Congrats on the short story! That's exciting! ooh, love it, you're doing great! and I LOVE that line!